At the end of April, Katie Fahey will pull up at Grand Rapids’ modest airport in a ride that’s anything but: a limousine. She’ll be headed to the Tribeca Film Festival in New York City, where a documentary about the organization she founded to end political gerrymandering will premiere at $24 a ticket. The festival insisted she ride to and from the airport in style. Fahey — a 29-year-old who spent at least a portion of election day in American flag onesie pajamas — told festival organizers she was fine calling an Uber to the airport, which is about ten minutes from her home. No dice. It’ll be embarrassing, she said with a laugh, but what can you do? Welcome to Fahey’s new life (or at least part of it) since the grassroots group she started with a Facebook post upended Michigan’s redistricting system with more than 60 percent of the vote last November. It’s now been nearly five months since voters approved a citizens’ redistricting commission proposed by Voters Not Politicians. But Fahey won’t be sticking around to shepherd the change she helped initiate. The Voters Not Politicians founder is leaving the organization to lead The People, a national group that aims to initiate policy change based on the public’s priorities. 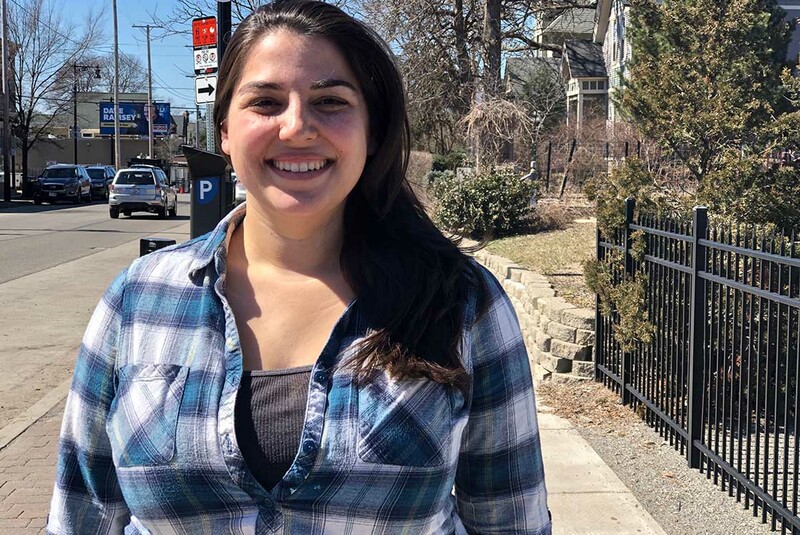 Since the 2018 midterm election, Fahey has spent much of her time flying around the country sharing her group’s story and best practices for organizing citizen-centered political movements at conferences and colleges. Her schedule has been grueling and glamorous — in January and February alone, Fahey went to Florida, Boston, Washington D.C., New York, Las Vegas, and California twice, sometimes on a day or two’s notice. In February she spent only six days at home in Grand Rapids, sometimes for only 12 hours before heading once again for the tarmac. Fahey met some political idols (like government ethics advocate Lawrence Lessig), reconnected with organizers who spearheaded redistricting reform efforts in Missouri, Colorado and Utah, and spoke with national advocacy organizations such as the League of Women Voters and Common Cause. In January, she upended what was meant to be a two-week vacation (she worked nine of those days) to attend Arnold Schwarzanegger’s “Terminate Gerrymandering” conference in Los Angeles. Afterwards, the former governor and movie star insisted on introducing Fahey to his girlfriend. The whirlwind punctated a dramatic period of change for Fahey, who just over two years ago led a quiet, stable life in Grand Rapids working in environmental sustainability. That life in many ways ended when, on the day after the 2016 presidential election, she posted to Facebook a desire to take on political gerrymandering in Michigan and asked if anyone wanted to join her. By 2018, VNP’s ability to attract thousands of volunteers to get the issue on the November ballot had thrown the political novice into the national spotlight as the plan gained traction. “The only thing that’s been constant (over the last year) are my three dogs,” she said. She says being the face of Voters Not Politicians always made her uncomfortable; it took time to get used to being featured in the New York Times. Speaking with national organizations after the group’s victory last November planted the seed for her next move: “It opened my eyes that there is a ton of opportunity where the average person's voice is missing in a ton of those (political advocacy) conversations,” Fahey told Bridge over a recent lunch. Fahey had just finished a two-year-long sprint to the November election. During that time she’d quit her day job to work on the campaign full time. She had gone through a divorce with the emotional support of her VNP co-leaders. And she had learned on her feet how to negotiate the political world. With November’s passage of Proposal 2, Fahey turned to organizing VNP’s future, as she continued speaking around the country, holding weekly calls with would-be organizers in other states, recovering from a fatigue-induced concussion, and buying and selling a house. “I was like, ‘I will self destruct if I do not start creating time for (myself),’” she recalled. It was last summer, as her group was still fighting to put the redistricting proposal on the ballot, that she met Andrew Shue, a former television heartthrob (“Melrose Place”) turned left-leaning digital marketer who founded DoSomething.org, a nonprofit that helps young people engage in activism. Shue had been touring the country with Republican strategist Frank Luntz holding focus groups about America’s political divide. The pair came away from these discussions believing most Americans had common goals for the country, but few tools to have productive political conversations. Focus group members left feeling more connected, but didn’t know what to do about it. So Shue and Luntz secured a year’s funding to get a political organizing project off the ground and recruited Fahey to help them turn their vision into action. At the time, Fahey was buckling under the weight of multiple commitments, trying to organize VNP’s next turn while speaking to groups around the country eager to learn from her group’s success. Through Shue and Luntz, she now saw an opportunity to be effective elsewhere. “Designing and seeing the opportunity and connecting the dots has always been something I’m more naturally good at,” she said of her new job. From the start, Fahey and her co-founders at VNP had wanted to take a different approach to political activism. Their goal was clear: ending gerrymandering. Their strategy, however, was decidedly more populist. Organizers around the country, including traditional political campaigns, have since told them they didn’t know that a model like VNP’s — based on citizen input and powered so heavily by thousands of volunteers — could work. Once Fahey and her co-founders began rallying volunteers, they organized town hall tours of Michigan. They polled residents across the state on how (and whether) the state’s redistricting system should be changed. The proposal, which is now in the state constitution, was based on that feedback. VNP’s leadership team supported Fahey’s move to The People, said the groups’ new executive director and a co-founder, Nancy Wang. Fahey was also recruited by a few Democratic political candidate campaigns. She said she took a pass. “I am truly an independent and don’t want to work for either party so that was kind of an easier one” to turn down, Fahey said. Preserving a nonpartisan element at The People is important, Fahey said; she attributes the group’s early funding success to the political balance in leadership (Luntz is a Republican, Shue a Democrat and Fahey an Independent) and commitment to political inclusivity. It’s raised around $200,000 so far, she said, including a $50,000 investment in Fahey from New Profit, a Boston-based venture capital firm dedicated to investing in social advocacy and philanthropy. The firm told Bridge it chose to invest in her in part because “we have a crisis of trust in America with disengaged and disempowered constituents” and Fahey has an innovative plan to combat that. Fahey envisions each state will have a local chapter, where they’ll hold community conversations to determine what political issues matter most to locals. They’ll use that intel to form a political campaign. The national chapter will take information from local partners and translate it into advocacy at the federal level. Lobbyists, donors and politicians don’t have an incentive to change the status quo on such issues as campaign finance, transparency and voting access, she said. Fahey said her experience with Voters Not Politicians taught her how much politics works like an industry; vendors, consultants, marketers and funders all working in tandem to get people into office and have favored bills passed. Seeing that process from the inside made clear how rarely public policy is driven by what ordinary people are demanding, and it outraged her. Back in 2017, as Voters Not Politicians was first finding its footing, Fahey said that established political and “good governance” organizations tried to convince VNP to hold off on its campaign until 2020, which was more in line with the other groups’ strategic plans. The notion that VNP must follow traditional campaign practices and align with one party or another smacked of condescension. It implied regular people had no shot at winning if they ran the campaign their own way, she said. Other organizations that supported Voters Not Politicians viewed the group’s massive volunteer rolls as a mess to manage, not a resource to tap. Fahey said she’s determined to avoid that mindset in her own, rising career. She was such a great leader for VNP and I'm thrilled she is going to move this model nationwide. Michiganders should rise with Applause and Thanksgiving for what Katie Fahey did 4 Michigan's political scene. Voters Not Politicians will carry on without her. I wish her well as she takes this approach National. You have no idea how this will turn out. Always unintended consequences. Thank you NPR. They recently had a segment on one of their shows about anti-gerrymandering. Katie Fahey and her VNP efforts were discussed. The gist of their message was what I have been saying all along. Their is no such thing as a non-partisan person, and that citizen commissions already in place were not working as intended because the commissions in place did not always understand what their true role was and all the nuances of district boundaries, voting rights, and minority representation requirements. The democrats are rapidly learning that a 29 year old bartender should probably stick to bar tending. So once again, thank you NPR.